Students pass by the Mission Santa Clara de Asís at Santa Clara University. Timing is everything. That is an expression people around the world use in many situations. Generally, this expression means that taking action at the right time can be just as important as how well you do something. This is especially true when a student is seeking admission to a college or university, says Becky Konowicz. She is Assistant Dean of Undergraduate Admission at Santa Clara University, a private Jesuit school in Santa Clara, California. Konowicz notes that applying to colleges and universities in the United States can often be a long and complex process. This is partly because of recent changes to the admissions policies at many schools and increasing competition among applicants. 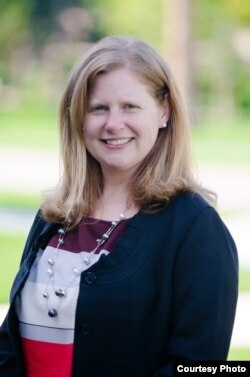 Becky Konowicz, assistant dean of undergraduate admission at Santa Clara University. What many students and their families fail to understand, Konowicz adds, is just how long the application process takes. Many people think the process begins in the final year of high school. However, Konowicz says students should start taking action well before that. Konowicz says students can get closer to finding the answers by visiting any college or university. It is not important if the student does not plan on attending the school. The visit can still give them a better idea of what to expect in that kind of environment. The next step, Konowicz says, involves testing. Most U.S. students take exams to prove their level of academic performance in the second half of their third year in high school. These tests include the SAT, once known as the Scholastic Aptitude Test, and the ACT. Some schools like one test more than the other. Konowicz adds that this is also the time when international students should be taking tests like the TOEFL and IELTS to prove their abilities in English. After taking these tests, the period between the third and fourth years of high school is a busy one for high school students, she says. This is the time when they should be narrowing the list of colleges and universities under consideration. Then, once they have made a shorter list, they should contact these schools and try to build a relationship with them. Konowicz notes many schools have email lists that students and family members can join. The schools’ emails can provide helpful information, she says. Also, college admissions officers often set up informational events, both at their schools and elsewhere, which students should attend. This will give students a chance to meet the people who may be considering their applications, she says. The next step is for students to begin working on a writing sample. Most U.S. colleges and universities require applicants to provide a writing sample that does more than show off their writing ability level. It also tells admissions officers more about who the applicants are. Konowicz argues that creating a good writing sample takes time, and students often need several attempts to get it right. So students should begin working on it even before their final year of high school. Also at this time, students should create a document clearly detailing the different requirements and closing dates for the schools to which they are applying. 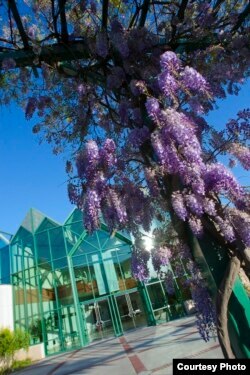 Flowers bloom on campus at Santa Clara University in Santa Clara, California. Once the final year of high school begins, students should get all the required materials together and ready for submission, Konowicz says. This includes putting the finishing touches on the essay and any documents needed for financial aid. Also students need to ask teachers and others with whom they have strong connections to write letters in support of their application. Konowicz says most U.S. colleges and universities require letters of recommendation. And it can take a while for someone to write one. So students should make their requests for these at least 30 days before the closing date. Finally, in the United States, most deadlines for college application materials are in early winter. But Konowicz suggests that students should submit all their application materials a week before the actual date. That way if any emergencies come up or mistakes were made, students have plenty of time to contact the schools, if necessary. Konowicz notes that spring is when most schools make their decisions and inform candidates if they will accept them. However, she says students should contact the schools a week after submitting their materials to ensure that there are no problems. If problems, such as missed deadlines, do exist, admissions officers will try their best to help. Admissions officers want to be as helpful as possible, she argues. Some will even send messages to applicants’ smartphones to restate upcoming deadlines and provide useful information. After all, Konowicz notes that helping students apply to college is why most admissions officers started working in this field to begin with. I’m ­Pete Musto. And I’m Susan Shand. Pete Musto reported this for VOA Learning English. George Grow was the editor. We want to hear from you. When are the deadlines for applying to colleges and universities in your country? How early do applicants begin the process? Write to us in the Comments Section or on our Facebook page.